President Muhammadu Buhari has warned that security agencies would deal severely with those he described as “unscrupulous characters” who make political fortune out of schoolgirls’ abductions in the country. 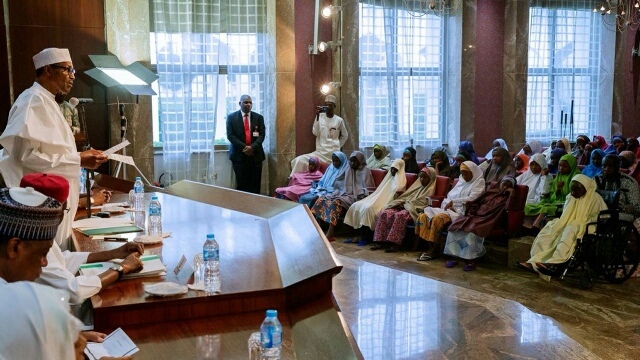 Receiving 107 schoolgirls and two primary school pupils from Dapchi, Yobe State, at the Presidential Villa, Abuja, yesterday, the President also threatened that any security chief who approaches his assigned task with levity , giving room for lapses, would be dealt with. The President insisted that Boko Haram insurgents released the Dapchi schoolgirls on Wednesday, unconditionally, after painstaking back channel negotiations, saying government opted for negotiations because it did not want any of the captives to be hurt , adding that the strategy had paid off with their release. While also appealing to the Chibok community never to lose hope or despair, Buhari said his administration was determined to bring back the remaining Chibok schoolgirls still being held by their abductors. He also urged insurgents operating in the northeast to cease hostilities and surrender, stating that his government was ready to accept the unconditional laying down of arms by members of the Boko Haram group who show strong commitment to do so. “We are ready to rehabilitate and integrate such repentant members into the larger society. This country has suffered enough of hostility. “Government is, therefore, appealing to all to embrace peace for the overall development of our people and the country. “I have tasked all the security agencies to work to ensure that we do not witness any recurrence of these incidents. Security chiefs have been warned, in clear terms, that any lapse on their part will be viewed seriously. “May I also warn those elements who have chosen to make political fortune of our citizens’ misfortune that government would not tolerate any attempt by any person or group to trivialise or politicise security issues for politically- motivated ends. Handing over the distraught schoolgirls, Director General of the Department of State Services (DSS), Lawal Daura, told the President that the negative impact of social media and what ordinarily should be a classified operation, as well as the utterances of some government officials, who were not competent to comment on the issues, posed challenges that almost marred the effort to secure the release of the schoolgirls. Daura, however, said despite these challenges, the DSS managed to successfully conclude the operation, leading to the release of the abducted Dapchi schoolgirls, in line with the clear directive to use peaceful options to ensure their timely and safe release. He added that beyond the release of the abducted girls, the DSS primary interest for engaging in the dialogue was informed by certain professional considerations, including permanent, possible cessation of hostilities, discussing the fate of the arrested insurgents and innocent Nigerian citizens being held hostage and possibility of granting amnesty to repentant insurgents. “These presently seem problematic, because the insurgents are factionalised, while holding various spheres of influence in their guerrilla controlled enclaves,” he added. Giving further insight into what transpired during the negotiations, the DSS boss said : “The insurgents’ only condition was their demand for cessation of hostilities and temporary ceasefire to enable them return the girls at the point they picked them. Daura also revealed that the released Dapchi schoolgirls were taken into the DSS medical facility and put through programmes to give them mental stability and they have been given psychological and mental evaluation conducted by trained specialists. “About four of them, who were discovered to have broken limbs, were sent for X-ray. Almost all of them had one skin infection or the other, having not taken bath for over a month. “They have been medically examined and those with ailments were treated. The measures are to ensure that they are in good health. ‘The girls, including four representatives of their school, the Principal and Vice, as well as their parents, were brought into the medical facility as part of measures to relief tension and anxiety. “The presence of these representatives have further re - assured and stabilised the girls,” he added.